Pros Realistic Physics engine • Graphics and sound are spectacular • Free to play	Cons For some reason a couple times DLC tables disappeared and had to redownload • Doesn't remember your initials for local leaderboard between attmepts. Last week, Zen Studios launched the iOS version of its popular pinball series of games which has previously debuted on both PSN, XBLA (under the name Pinball FX2) a little over a year ago. For fans of these console releases, you’ll be happy to hear that this iOS version plays nearly identically! Zen Pinball, is a free app and comes with one free table, Sorcerer’s Lair, which can be played in either single player or multiplayer (hot-seat) fashion. Players have (no less than) 8 different choices of table views, which seems a bit overkill and honestly a bit confusing. I recommend just trying out all combinations of viewing modes and table views and seeing what appeals to you most. There are zoomed out views which allow you to see the whole table at once, or more intimate camera-tracking views that follow the ball as it dashes around the table. Cycling between the views is easy, however an issue I had was when you change table view right before launching your ball, you no longer get the nice close-up view of the ball launcher, instead the launcher may even be a bit obstructed depending on the selected view. The controls are simple, just tap on the left side of the screen to control the table’s left-side flipper(s) and the right side of the screen for the flipper(s) on the right side of the table. You can shake the device to shake the table, but be careful not to tilt the pinball machine. 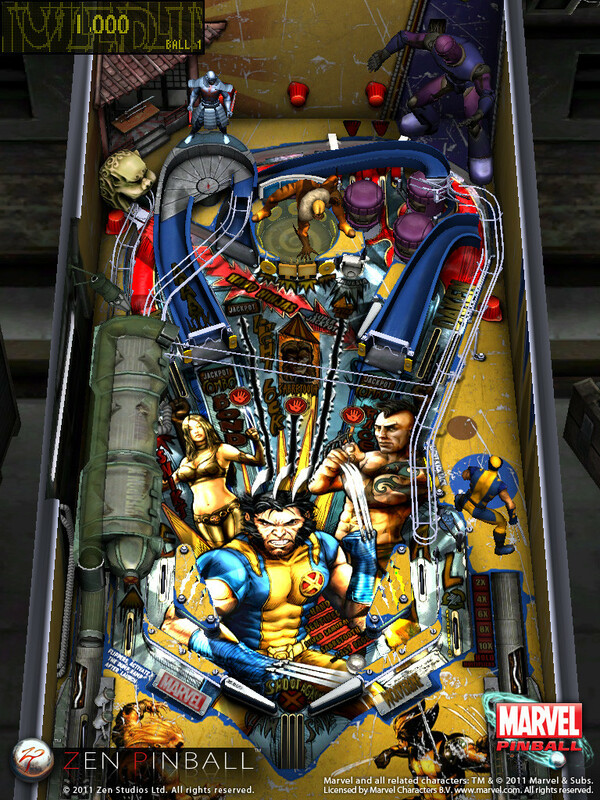 Overall, Zen Pinball feels just as comfortable as the XBLA release and when I compared the Wolverine and Captain America tables, as far as I could tell, they looked identical. The one notable exception being the lack of the vibrational feedback that you get on the 360 controller when ricocheting off bumpers. I’d love to see Zen Studios add this optional support for the iPhone. The game is a Universal app, meaning you’ll be able to play it on any of your iOS devices. While at first I was a bit skeptical about playing on the iPhone, thinking things would be way too small to enjoy, it actually plays quite well. In fact, adding to the counter-intuitiveness, I actually found that playing it in landscape more offered the best play on this device. It’s odd because your would think that with less distance from the top to the bottom of the screen, the ball would be flying way too quickly, but with one of the views where the camera tracks the ball’s movement, it makes for quite an enjoyable experience. Currently there are two additional tables available for purchase based on Marvel’s Wolverine and Captain America comic series. These tables are nothing short of FANTASTIC and well worth the additional $1.99 (each) price. For comparison, the Xbox’s Pinball FX2 currently sports something like 15 additional tables which sell for the equivalent of about $3 each. The menu screen shows that there are definitely more tables coming for iOS and a spokesperson for Zen Studios told me that going forward their goal is to release new tables day and date with the console versions of this game. Very cool! Hopefully they’ll branch out from just more MARVEL characters and release some classic pinball tables as well. As they add additional tables, I’d also love to see them implement a timed “trial mode” for future table DLC (like they have in the Xbox version) so you can test drive new tables before buying them. While you are playing, there are notifications that appear on the side of the screen to let you know when you’ve bout to and then ultimately do surpass your previous high score, or one of your OpenFeint friends’ high scores. There are local and global leaderboards for each table as well as achievements and a unique challenge system which gives you mini goals to strive for. It utilizes both Game Center (overall score and achievements) and OpenFeint (since the title is also available on Android as well). Outside of the game’s fantastic graphics, there are some really great touches that make this pinball game stand out. First off, there are 3D characters that interact with the game, like a HUGE Sentinel on the Wolverine table and there are also some cool sub-tables that you can end up in that add a neat twist. 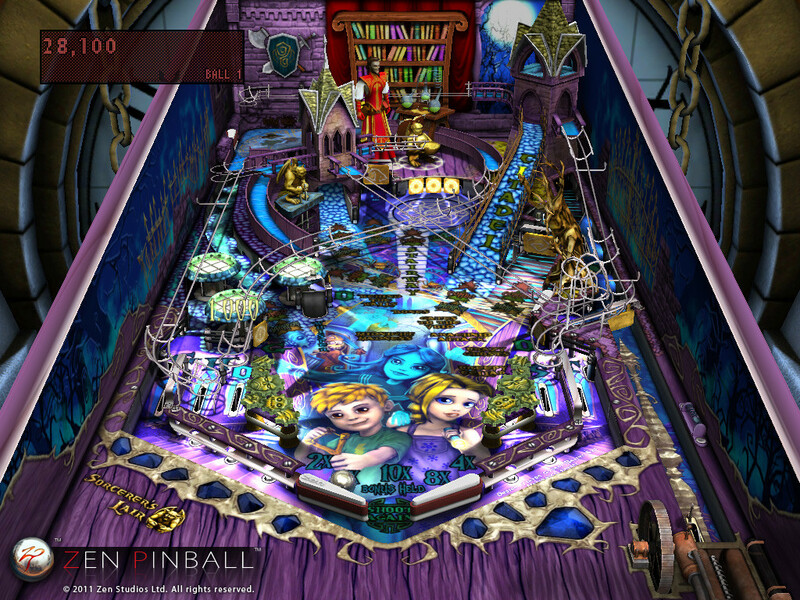 Zen Pinball is easily one of the finest pinball games available on the platform. The graphics and sound are spectacular, the physics engine is phenomenal and it’s free to play model makes it instantly accessible and approachable. You’ve really got no excuse not to try out this game, heck, you don’t even need a quarter. I’m sure I’m not the first reviewer to use this pun, but this game is Flippin’ Fun!